Did he bend down and embrace his foster daughter, as he wanted to? Did he tell her that he was sorry for what was happening to her, to her mother, for what had happened to her brother? He clenched his eyes. Then opened them. He slapped Liesel Meminger squarely in the face. “Don’t ever say that!” His voice was quiet, but sharp. This book just launched itself directly onto my list of favourite books of all time! 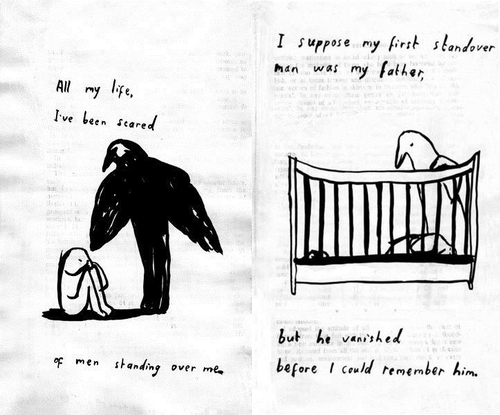 The Book Thief is narrated by Death – this is what first drew me towards it. 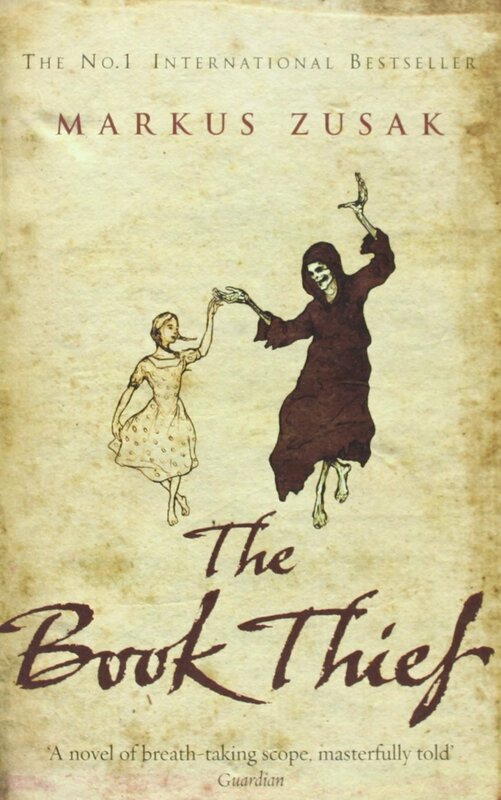 The front cover depicts a young girl skipping hand in hand with the Grim Reaper – how could I not want to read this? Despite my excitement I was less than enthused by the way the book began. The whole prologue had vaguely unnatural feel to it. I found it really difficult to get into and I worried that the whole book would continue in the same jarring, start-and-stop style. I knew I wouldn’t be able to force my way through the 500+ pages of text if Zusak didn’t grasp my attention soon. Thankfully, my worries were in vain. It was as though someone turned on a light, and I suddenly went from being vaguely uncomfortable to completely in my element. The rest of the book is written in a similar style, but whereas the prologue felt awkward and unnatural, the proceeding chapters click perfectly into place. The book thief’s story begins in 1939 in Nazi Germany. Liesel Meminger is taken to Himmel Street in Molching, to the home of her new foster parents, Hans and Rosa Hubermann. Her communist parents have been taken away to concentration camps, and her young brother did not survive the journey to their new home. On her first night in Himmel Street as she lies in her new room, the bed reserved for her brother lying empty next to her, she is plagued by nightmares of her brother’s death, and awakes screaming in a cold sweat. Her foster father, ‘Papa’, comforts her, reading to her from The Gravedigger’s Handbook – Liesel’s first stolen text. As political tensions in Germany increase, Hans is called upon to fulfil a promise he made years before, forcing him to harbour a deadly secret, and placing the family constant danger. Despite their fears, relationships in the family grow stronger and each night Hans continues to read with Liezel. As her book collection grows, Liesel recognises the power of the written word and slowly begins to write her own story. Zusak’s style, while perhaps slightly jarring at first, is wonderfully unique. 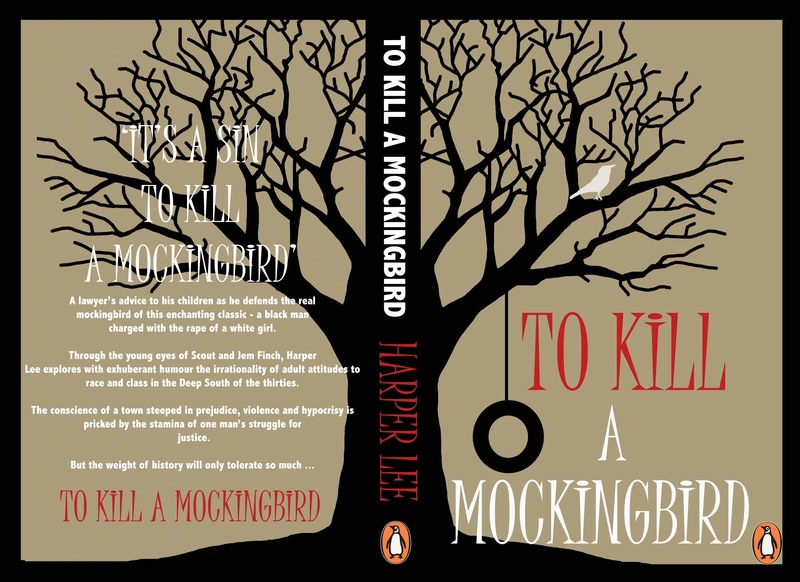 The story is separated into small chapters, each focusing on a very specific point in time, with death drawing out the relevance of each occurrence to the wider story. The text is broken up with pictures, handwritten notes, and regular snippets of background information in amongst the main tale: brief statistics, information on Stalingrad, small observances, and even a pamphlet made from the painted-over pages of Hitler’s Mein Kampf, are all slipped into the flow of the text. The presence of Death as a narrator is interesting, and works really well given the context of the book. Throughout the novel the shadow of loss hangs heavy over Nazi Germany and Death himself is a constant feature on every street corner. As a narrator, Death foretells of which characters are due to meet their demise. Zusak allows you to fall in love with characters you know are going to die. And no, this doesn’t ruin the ending, it adds to the overall tension which builds up over the course of the book. It is as though you are placed in the midst of the inhabitants of Himmel Street, knowing that war will claim some of those that you love. Waiting to find out when Death will strike is the real struggle. The Book Thief is unique amongst WWII fiction as it tells the tale of war-torn Germany from a Nazi-child’s perspective. Liesel Meminger is a wonderfully-developed and complex character who is just beginning to form her own understanding of the world. She understands the importance of doing as she is told out in the street, of Heil Hitler-ing the lady in the sweet shop and attending Hitler Youth in a neatly pressed uniform. But inside, she conceals her own personal judgements and aspirations, harbouring thoughts that must not be spoken outside the walls of 33 Himmel Street. The Book Thief is marketed as a book for young adults, but I struggle to see how anyone, whatever their age, could fail to enjoy it. If you are interested in WWII fiction, or, like me, in historical fiction in general, then this really is a must read.